myWaitrose members can enjoy Waitrose & Partners Food magazine featuring recipes and articles from the world's best chefs and food writers, for free. Simply pick up a complimentary printed copy of Waitrose & Partners Food when shopping in store, while stocks last, or download the magazine app which is now accessible on even more tablets and on smartphones*. myWaitrose members can download the Waitrose & Partners Food app edition for FREE by going to the App Store or Google Play and signing up with their myWaitrose membership number. By subscribing for free, you'll receive each new issue of Waitrose & Partners Food straight to your tablet along with a handy reminder when it's published. *Avaliable on devices running iOS7 or later, or Android 4.0.3 or later. myWaitrose membership number required for sign up. What is your store cupboard essential and why? Share insider foodie tips from your hometown. Where are the best places to eat out for breakfast, lunch and dinner? Pick up your complimentary copy of Waitrose & Partners Health magazine. You’ll find it by the checkout, while stocks last. This is a health magazine with a difference, celebrating the positive feeling that comes from being healthy. Whether you want to eat better, move more or feel great, Waitrose & Partners Health magazine gives you motivating, easy tips that you can apply to your everyday life. Packed with brand-new healthy recipes and in-depth features on health and food trends, Waitrose & Partners Health magazine will guide and inspire you to feel the benefits of healthier living. 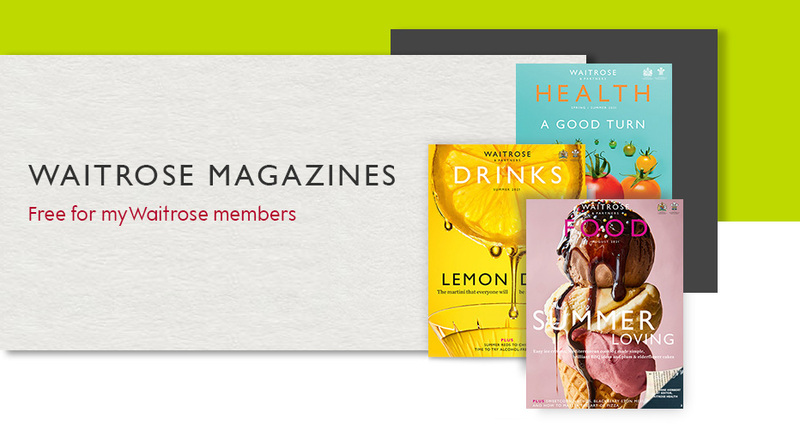 Waitrose & Partners Health magazine is £2 or free to myWaitrose members, while stocks last, no purchase necessary.